Bass music in the UK is arguably at it’s highest point ever, with festival bookings for bass artists currently hitting record heights and line ups around the country becoming more and more bass ready. This is due to a level of consistency that the higher ranked platforms and outlets are being able to hit more than anything, with the levels of creativity and quality rising at every turn. One label that has supplied the scene with both innovative sounds and extremely high levels of consistency since it’s conception is Saucy Records, a project that stacks a combination of well established UK bass names and exciting up & comers on it’s roster, a set up which continues to yield fantastic results. This week, we see the label celebrate their 100th release, an achievement in itself, before we look at the line up they have put together on the celebratory single release to go with it. We see a Boomtown 2018 link up return here as Barely Royal, Pelikann, Affiliate & Licked join forces, re-establishing their representation of Saucy of Saucy on the world famous Sector 6 stage. Joining them as well we hear the return of Purple Velvet Curtains on vocal duty, an area we have seen him explore more and more in recent times, with his unique tones sitting perfectly on a number of forward thinking bass originals. This recording as a standalone project is simply phenomenal to tell you the truth, from it’s emotive introductory harmonic structures, to the immense reesey pre-breakdown expanse and even more hard hitting drop, stacked with lethal bass tones, unpredictable synth movements and non-stop high energy drum work. 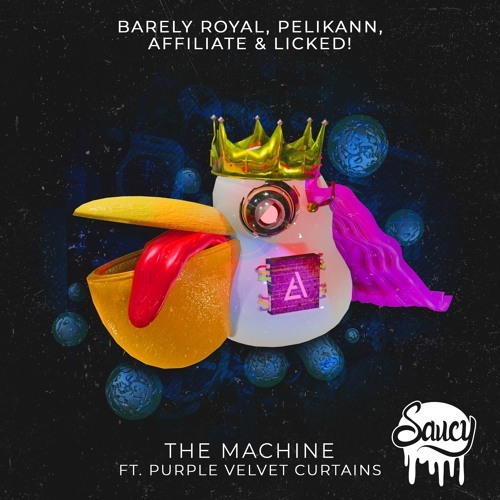 We want to send a salute to Saucy Records for their contributions to UK bass music over the last 100 releases, keeping our appetites appeased with some of the most forward thinking music on the market.